David Webb had a great segment in today's 9am hour that talked about Trump's actions (not his rhetoric) being much tougher than the last few presidents on russia. It was presented with specific examples. So if he jumps all over it, the dems claim his presidency isn't legit. If he ignores it, he's accused of being in bed with putin. All parties have denied it, and we know something happened.. is it possible that meddling wasn't ordered by putin himself? Sure it is but the left/media will never accept it, true or not. At this point to harp on it further will only erode the ability of the two to work together from here on out. The sanctions on putin's circle of friends and cronies are real... (and he detailed them out on air) so the fact that Trump says we should be friends and work together w/ Russia is media food but the sanctions say he actually much more serious than O or W about holding them accountable. My own $.02 - And as far as lindsey graham is concerned, an less than g-rated expression about a 2-bit hack, sucking eggs comes to mind. Missed the news for the last decade? Change Russian President to any foreign leader and that's precisely what obama's apology tour was. john brennan???? Yep, he's been an impartial, above board guy these last few years. That's like saying "CNN said...."
I am so upset with Trump that he did not tell the world that Russia stole the election from Hillary and got him elected through spying, leaks and dirty tricks. I t was the prefect chance to come clean and say he was the imposter President and that Hillary really deserved to be President instead of him. After all she was the prefect candidate and since she was predicted to win, the job should be hers. “You have been watching perhaps one of the most disgraceful performances by an American president at a summit in front of a Russian leader certainly that I've ever seen. An extraordinary press conference." Anderson Cooper. My Facebook feed is filled with these. Let’s see if I can find the John McCain quote. May be Anderson is a Republican now. In August 2017, Trump signed into law the Countering America’s Adversaries Through Sanctions Act, or CAATSA, despite calling it “seriously flawed.” Congress passed this law by an overwhelming majority in response to trumps perceived bid to lower sanctions on Russia. Trump then bypassed a congressionally mandated deadline in January to act on the bill and impose new sanctions on Russia for the election allegations. Sanctions were finally imposed on members of Russia’s elite and their business entities in April, after 13 Russians were indicted by the U.S. Department of Justice (ie Mueller's "witch-Hunt") for “malicious cyber-enabled activities” in March. In April trump, In the wake of another chemical attack by the Assad regime on Syrian civilians, took to Twitter to threaten the dictator — and his sponsor state, Russia. “Russia vows to shoot down any and all missiles fired at Syria. Get ready Russia, because they will be coming, nice and new and ‘smart!’” he wrote on Twitter in April, lambasting the country for supporting Assad, whom he called a “gas killing animal.” Washington's UN ambassador Nikki Haley promptly promised further sanctions against Russia for its refusal to condemn the chemical attack — only to be left hanging when Trump walked back his threat and no new sanctions were imposed. In early July, Trump seemed to challenge the long-held U.S. policy of refusing to recognize Moscow’s Crimea annexation, saying only in response to questions on the issue: “We’ll see.” He also reportedly argued to officials at June’s G-7 summit that Crimea should belong to Russia because “everyone there speaks Russian.” Clearly, he doesn't understand this issue at all. 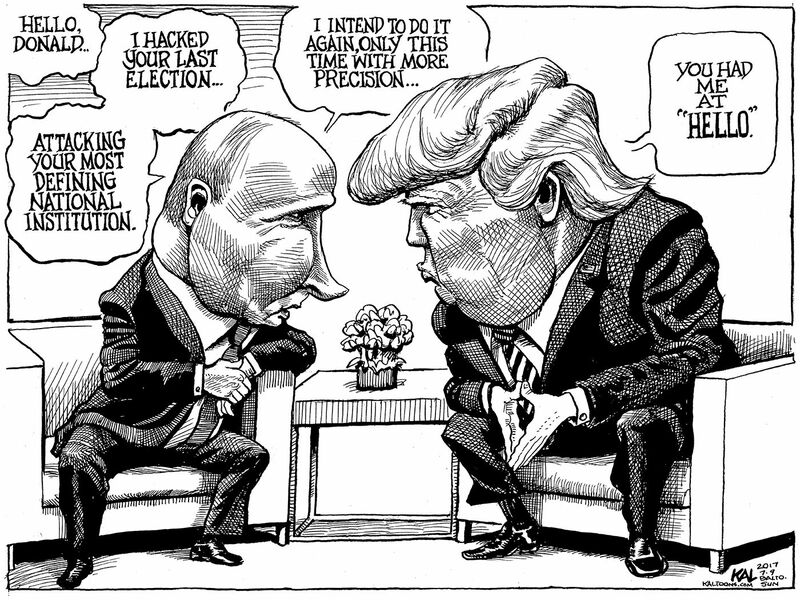 Time and again trump has dealt with russia, but only in what seems to be a reluctant manner at best. Now we have him blaming everyone one but russia for what is clearly russian aggression both here and abroad. To top the previous acts or lack therof with this tiptoeing around another dictator does not help American interests. Some just can't accept Trump has already been more successful in foreign relations than the previous 3 presidents. Being successful in foreign relations isn't how much they like us but how much they respect us. I believe Trump is giving the Russians an opportunity to come around. It seems some consider anything less than nuclear war with Russia and the North Koreans failure on Trump's part. No one has been softer and more friendly with the Russians than the Clinton/Obama Cabal. Any American pre-teen could hack Her Marxist Filthiness' unsecure server that was located in her basement. Ditto for the DNC servers being "maintained" by completely unqualified "Pakistani Computer guys". As for the CIA / FBI under Obama, what can you say? From Brennan to Clapper to Comey, every single one had an anti-Trump agenda underwritten by Obama. 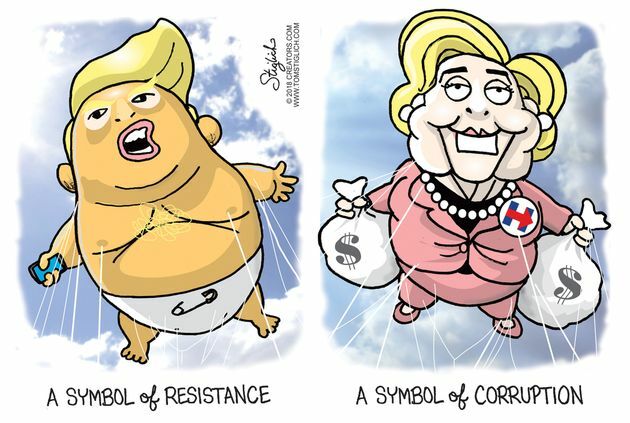 Follow the money, remember Uranium One and please seek treatment for acute Trump Derangement Syndrome! Last edited by Bitter Clinger on Tue Jul 17, 2018 7:17 am, edited 1 time in total. Funny the best you can do is come up with a childish cartoon fabricated on conjecture while seeming to completely ignore what actually happened and was documented on video. That YouTube video is more proof of collusion than anything the dems and Mueller have come up with against Trump. Except that trump only acted AFTER Mueller indicted 12 Russians in March. As far as N Korea... still waiting on something more than a photogenic handshake and a conclusory announcement that everything is resolved. At this time trump appears weak at best, certainly not "America First". Is Donald Trump committing treason? The Boston Globe dare asks the question. The interesting thing about this particular post is that I know we have 2 liberals that have some belief in the 2ndA. At least I am assuming they do and are not just hanging around here to stir the pot.